ISTANBUL, May 28, 2018 (BSS/AFP) - Looking up at the giant wooden edifice looming over him, Erol Baytas shakes his head. "I don't think it will survive another winter," he says, broken tiles and boards strewn at his feet. Built at the end of the 19th century on an island off Istanbul, this unique six-storey structure once served as a home for Greek Orthodox orphans until it was shut down in the early 1960s. And more than five decades later, the now dilapidated Prinkipo Greek Orthodox orphanage is at risk of collapse. To try and save this architectural treasure -- described as the largest wooden construction in Europe and the second largest in the world -- cultural heritage NGO Europa Nostra has listed it as one of the continent's seven most endangered sites. "It's a miracle it still stays standing," said Baytas, who spent more than 30 years guarding it. Situated atop a hill on Buyukada, one of the Princes' Islands in the Sea of Marmara, it is about 90 minutes by ferry from central Istanbul. Originally conceived as a luxury casino hotel, the building was commissioned by the Compagnie des Wagons-Lits, the travel firm which historically operated the Orient Express. The aim was to attract well-heeled European travellers who were flocking to Istanbul in great numbers at the height of the Belle Epoque, many arriving on the famous long-distance train. Designed by Alexandre Vallaury, the Franco-Ottoman architect behind Istanbul's Pera Palace hotel, the hotel was completed in 1898 -- but never managed to get an operating licence from Sultan Abdulhamid II on grounds its gambling activities would be immoral. With its grand plans floored, the timber-framed structure was sold to the wife of a rich banker from the city's Greek minority who gave it to the Ecumenical Patriarchate of Constantinople. And in 1903, the patriarchate turned it into an orphanage, which took care of nearly 5,800 Greek Orthodox orphans until its closure in 1964. "It was without a doubt the most beautiful place in Istanbul," says Yani Kalamaris, who lived and worked at the orphanage as a teacher between 1955 and 1961. Sitting in a leather armchair in the lobby of a large Istanbul hotel, he reaches into his bag and pulls out a photo album with a worn cover, its pages filled with sepia photos of what he fondly remembers as his "house". "This was after the end-of-year ceremony," says Kalamaris, now 83, showing a picture of him standing in the middle of a group of children on a large terrace overlooking a garden with a breathtaking view of the sea. Today, all that's left there are a few twisted beams. Since the orphanage closed, the building has taken on the air of a haunted house, with staring empty windows and crows perching in the many holes that pock its dull brown facade. With no-one to care for it, the structure has been ravaged by Istanbul's ferocious winds, its blistering summers and frigid winters. Despite its dilapidated exterior, some of the 220 rooms inside still retain vestiges of splendour, such as the ballroom with its boxes and balconies, its columns and its once-lustrous parquet floors. "Once, an old man came who was an orphan here and who lives in Greece today and we went inside together," Baytas said. "I had to take him in my arms and we cried like kids." The orphanage was closed down by the Turkish authorities in April 1964, officially on grounds of sanitation at a time of political tension between Ankara and Athens over Cyprus -- a dispute which would eventually see Turkey invading the island a decade later. Today, Istanbul's Greek Orthodox minority, who only number around 3,000, are determined to save the dilapidated structure before time runs out. "This building belongs to all of Turkey, the people of Istanbul, the local culture," says Apostolos Poridis, the patriarchate's chief architect. "Its architecture is a matter of memory, you have to protect this building, to pass it on," he told AFP. In April, the Archbishop of Constantinople and Ecumenical Patriarch Bartholomew I asked for Ankara's help during talks with Turkish President Recep Tayyip Erdogan. But the plea comes at a time of fresh tensions between the two nations over an array of issues, including the protection of Byzantine and Greek heritage in Istanbul. "We have lost a lot of time. But it is not too late," said Piet Jaspaert, vice president of Europa Nostra. 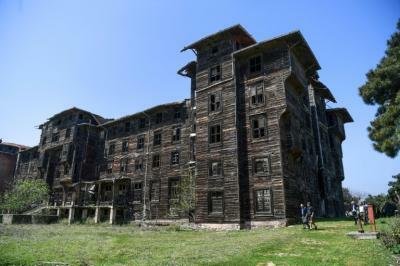 This summer, a team of experts will visit the site to assess how much work needs to be done to renovate the building -- and the likely cost, a figure the Turkish media suggest could be as high as $50 million (42.3 million euros). "The main frame is solid, but the big problem comes from the roof," said Poridis. Before the work starts, experts say the installation of an internal roof is urgently needed before the onset of winter. "I would like to see the building (restored to) the splendour of yesteryear, one last time," says Kalamaris. "I hope it (happens) quickly."